On the 7th (Fri), take in a show at Hopi House, then take in breathtaking views at Grand Canyon South Rim, then take some stellar pictures from Mather Point, and finally engage your brain at Yavapai Geology Museum. To find traveler tips, maps, ratings, and more tourist information, read Grand Canyon National Park trip itinerary planner . Clarksville to Grand Canyon National Park is an approximately 18-hour flight. You can also drive. Due to the time zone difference, you'll gain 1 hour traveling from Clarksville to Grand Canyon National Park. Expect much colder evenings in Grand Canyon National Park when traveling from Clarksville in June, with lows around 42°F. Cap off your sightseeing on the 8th (Sat) early enough to go by car to Sedona. Get a sense of the local culture at Walnut Canyon National Monument and Amitabha Stupa & Peace Park. Escape the urban bustle at Cathedral Rock and Red Rock Scenic Byway (SR 179). There's lots more to do: take in the spiritual surroundings of Chapel of the Holy Cross, take in breathtaking views at Oak Creek Canyon, take in the exciting artwork at Exposures International Gallery of Fine Art, and explore the striking landscape at Bell Rock. To find photos, reviews, more things to do, and other tourist information, use the Sedona tour itinerary app . Drive from Grand Canyon National Park to Sedona in 2.5 hours. 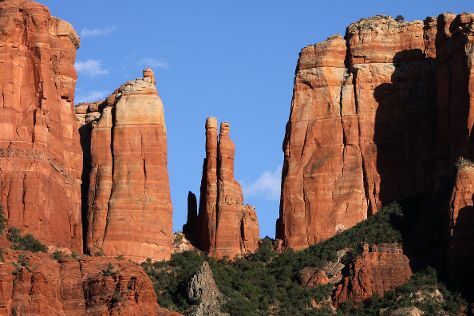 When traveling from Grand Canyon National Park in June, plan for somewhat warmer days in Sedona, with highs around 94°F, while nights are much hotter with lows around 68°F. Wrap up your sightseeing on the 10th (Mon) early enough to travel back home.